We have now come to the end of this Sherlock Holmes series. It’s definitely been quite the ride with a whole lot of excellent films. Interestingly enough this one is more of a thriller than a mystery since we all know who the villain is, but that’s where the game of cat and mouse comes into play. We even get to see the villains trick Watson one last time. Legends say that there are 3 music boxes which hold immense power. If you gather all 3 and listen to the music, it will tell you a secret code that will lead to a treasure worth a large fortune. Naturally the villains want to grab these 3. They manage to snag 2 of them, but an innocent small business owner bought the third and then Holmes bought it from her to keep the lady out of danger. Hilda and her posse are prepared to fight to the death with Holmes. Can the detective really hope to come out of this unscathed? In a way this film also felt a bit like a homage to the others so I wonder if the series knew that it was coming to an end. For example, it has been quite a while since Holmes was knocked out by the enemy and captured but that happens here. It wasn’t part of the plan or anything like that either so it certainly wasn’t his best moment. Still he did a good job of thinking up a plan on the spot and finding the escape route with the largest % chance of escape is just what you would expect from him. He’s still the best character in this film and definitely appears to be a little more merciless at the end as well as he talks gleefully about how the villains will be hanged. Then we have Watson who is tricked by the villains one last time. It is child’s play for Hilda to use a smoke bomb to distract the assistant while she got away from the loot. It wasn’t a very promising start for Watson and he looked pretty bad but at least he took it in stride. Surprisingly he didn’t really help at the end to make up for this moment. I guess he can’t come out on top every time. Next up is Hilda who makes for an interesting antagonist. She is definitely intelligent as she outwits Holmes in their first outing and comes close to achieving her objective. She isn’t quite as ruthless as some of the other villains as she prefers not to destroy her opponents but that can also be her undoing. Had the bald man been spared he could have easily identified her to the police which would be risky. As always the writing is on point here. All of the characters are very polite even when threatening each other with death. They are chivalrous all the way through and one villain even allows Holmes one last smoke before he is to die. It’s definitely something that will be missed in the newer films. It’s also impressive just how much content the film is able to squeeze into each case since the movies are always so short. It always does a good job of making each scene count. That being said, this film may have had one of the weakest intros. Maybe it wasn’t actually that long but it felt like a little while before Holmes and Watson actually appeared. At first the film was showing off the boxes and explaining that origin but the whole time you are just waiting for the crime to start. The auction was pretty interesting though. Overall, Dressed To Kill is a reasonably good send off. It would have been perfect if it had ended with the second to last film instead, but we’ll take what we can get. Imagine ending on the first World War II adaptions…now that would have been something. Sherlock Holmes never overstayed his welcome in the cinema and managed to end without missing a beat. I highly recommend checking this film out to see just how much fun these old school murder mysteries are. I don’t know what mystery film I shall be checking out next but it certainly has a high bar to match. 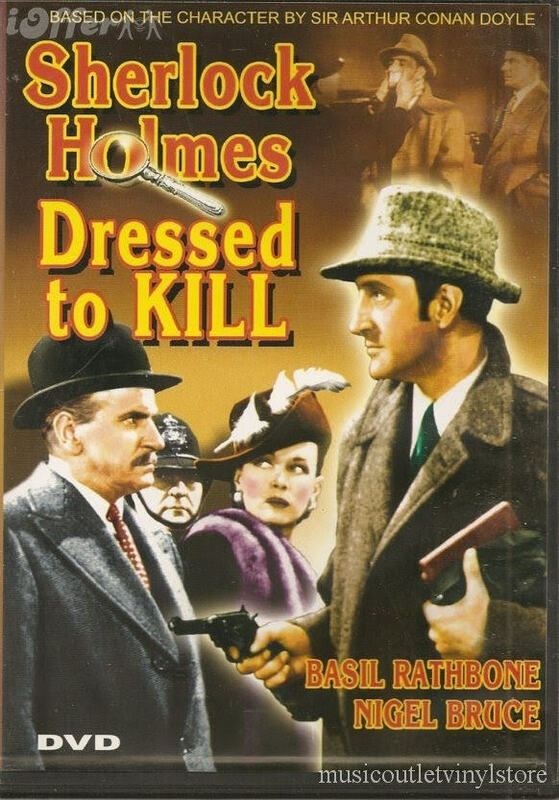 This entry was posted in Live Action Movie Reviews, Live Action Movies, Reviews and tagged Dressed To Kill, Film Review, Movie Review, Mystery, Review, Sequel, Sherlock Holmes, Thriller, Watson by dreager1. Bookmark the permalink.